Although it dates back to the 12th century, Traquair House is a fine example of 16th and 17th century castle architecture, having undergone limited alterations since that time. The earliest mention of Traquair is in 1107, when Alexander I stayed here, and it was apparently used as a hunting lodge by many of his successors and descendants, namely David I, Malcolm IV, William I, Alexander II and Alexander III. In the mid-13th century Traquair belonged to Thomas de Mautelant, an ancestor of the Maitland Earls of Lauderdale. Mautelant gave the estate to his son, William, upon his marriage to Elizabeth, daughter of William Watson of Cranston. Elizabeth’s brother, also William Watson, had a charter of the lands of Traquair with the consent of his brother-in-law, William de Mautelant, in 1427 on the condition that should he (or his uncle Robert and cousin Roger Watson) fail to produce an heir the lands would pass to Andrew Murray, the son of John Murray of Blackbarony. It seems that the Watson line failed since by 1464 the Murrays were in possession of Traquair. In the same year however William Murray was forfeited and Traquair passed through the hands of various individuals. Firstly they were given to William Douglas of Cluny then to Robert Boyd, 1st Lord Boyd, upon whose own forfeiture in 1469 they returned to the Crown. James III then granted the estate of Traquair to one of his his favourites, an eminent musician named Dr William Rogers. In 1478 Rogers sold the estate to James Stewart, Earl of Buchan, the King’s uncle. The Stewarts have been in residence ever since, and Traquair House is said to be the oldest continuously-inhabited house in Scotland. Dating from this period are the oldest parts of the castle which can be dated with any certainty, a late 15th century tower house occupying what is now the north corner of Traquair House. However it is likely that this tower, consisting of three storeys plus an attic, incorporated earlier elements within it, and it has been suggested that the ground and first floors date back to the 12th century. The first floor consists of a bedroom known as the Kings Room and a dressing room next door. Above this on the second floor is what is now known as the Museum Room, which is said to date back to the 14th century. One of the walls features a mural thought to have been painted around 1530. In the 16th century this tower was extended to the south-east, possibly by James’ son, also named James, and styled the 1st Laird of Traquair. The extension more than doubled the length of the old tower, forming a main block measuring around 21 metres north-west to south-east by around 9.6 metres across. It also consisted of three storeys plus an attic. The basement is vaulted, and made up of 4 chambers, each of which are accessed via a corridor running the full length of the block on the south-west side. Originally there would have been no access to this corridor at ground floor level, with an intra-mural staircase at the north-west corner of the block leading to the first floor. This staircase also served all the floors, and was topped off with a small corbelled-out caphouse. The main staircase was a wide spiral housed within a small projecting tower at the south-west corner of the main block, and the original entrance was most probably in the re-entrant angle. In the late 16th century a new wing was added, running south-west from, and flush with, the stair tower, giving the castle something like a Z-plan. In the re-entrant angle created by the join of these two phases of building, to the south-east, a new extension added an extra room to each floor in 1599. Further additions were made to Traquair House in 1642 by John Stewart, who had been created Baron Stewart of Traquair in 1628 and the 1st Earl of Traquair in 1633. He was Lord High Treasurer of Scotland from 1636 to 1641. He created a new entrance porch on the front of the late 16th century block, and the bottom of the spiral staircase was diverted to meet it. The 1st Earl also modified the attic level, adding dormer windows and steeply-pitched roofs. The central of three dormer windows on the late 16th century block carries the carved date 1642 on a pediment. Small corbelled-out turrets were added to the front corners of the new section, one of them being added to the top of the old stair tower. Up until this point the River Tweed had flowed very close to Traquair House, giving it a good defensive position as it was also protected by the Quair Water on the east side. The 1st Earl is said to have diverted the river “northwards for a distance of two miles from its old course” in order to extend his gardens, and the Well Pool to the north-west of the house is said to be a remnant of the river’s original course. 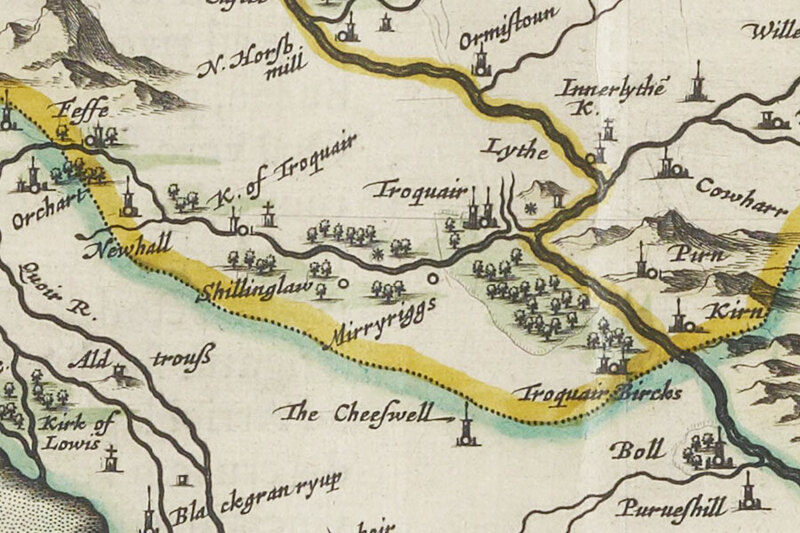 Looking at modern maps, if the two miles is correct then it suggests the original course flowed in from the north-west, curved around Traquair House, met the Quair somewhere north-east of the house, then approximately followed the edge of the road until meeting the Leithen Water south-east of Innerleithen. In the late 17th century there appear to have been plans for a significant remodelling of the house, with a drawing dated the 27th of September 1695 showing the late 16th century block mirrored on the opposite side of the older block, with a new entrance in the centre. Another set of drawings shows a more drastic proposed remodelling in a Renaissance style. However neither of the plans were carried out, and instead two new low wings were added, extending from the north-west and south-east corners of the main house and creating a courtyard. These new wings are one storey and an attic high, with the north wing also having a stable at basement level as the ground falls away on that side. The north wing has a chapel at ground floor level, while the south wing originally contained a brewery. The ornamental gardens are also thought to have been laid out at this time, with terraces being built at the back of the house. The exterior of Traquair House has changed little since this time, although considerable interior remodelling was carried out in the 18th century. In the first half of the 18th century a grand new tree-lined drive was laid out to the south-west of Traquair House. At the end of the drive a pair of imposing stone pillars were built in 1738 by the 5th Earl of Traquair, topped off with sculptures of bears holding the family crest. These Bear Gates were famously closed following the visit of Bonnie Prince Charlie in 1744, with a vow to keep them shut until a Stuart king once more sat on the throne. They have remained closed ever since, and a smaller driveway was constructed to their south-east. When Charles Stewart, the 8th Earl of Traquair, died childless in 1861, Traquair House passed to his sister, Lady Louisa Stewart, and the earldom became dormant. Following her death in 1875 the house passed to a cousin, Henry Constable-Maxwell of Terregles, the Stewarts having intermarried with the Maxwell Earls of Nithsdale in the preceding centuries. He added Stuart to his name, and Traquair has remained in the Maxwell Stuart family ever since. Traquair House is now open to the public during the summer, hosts weddings, provides bed and breakfast accommodation, and brews beer at the Traquair House Brewery, which opened in 1965. Traquair House is in the parish of Traquair and the county of Peeblesshire. Published on the 21st of May 2011 at 11:29 pm. Updated on the 16th of May 2018 at 11:41 am.